Last week, I hopped on a plane for a whirlwind, fast-paced, less than 24 hour trip to the Walt Disney World® Resort in Lake Buena Vista, Florida. It was a quick trip, that’s for sure, but there was an exciting premise behind it. Y’all, Glidden is sponsoring an exhibit at INNOVENTIONS at Epcot®! And I got to be there for the grand opening! I flew in late Thursday night in anticipation of the ribbon cutting ceremonies before the park opened on Friday morning. 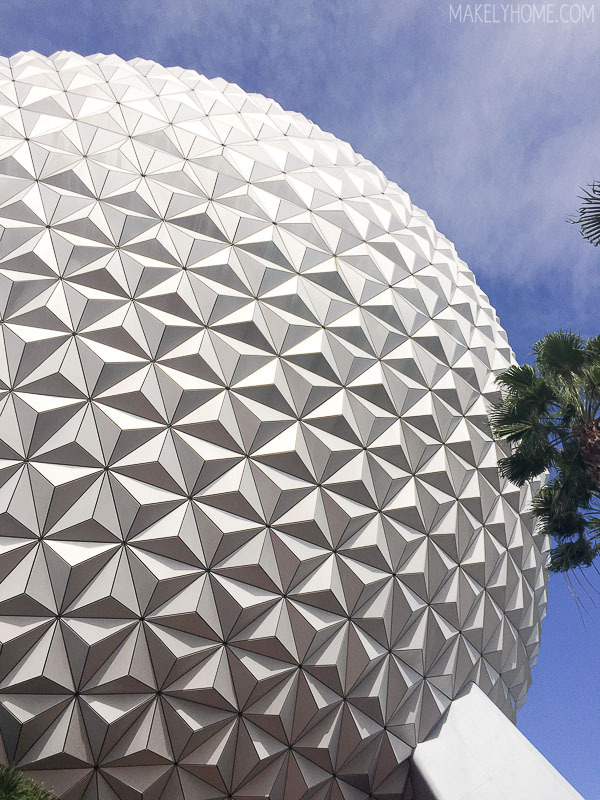 If you have ever been to Walt Disney World® Resort, you may known that INNOVENTIONS is located near the base of the Epcot® icon, the Spaceship Earth geodesic sphere. This sight never ceases to amaze me. Inside the exhibit, we were treated to the fullWalt Disney World® Resort experience. 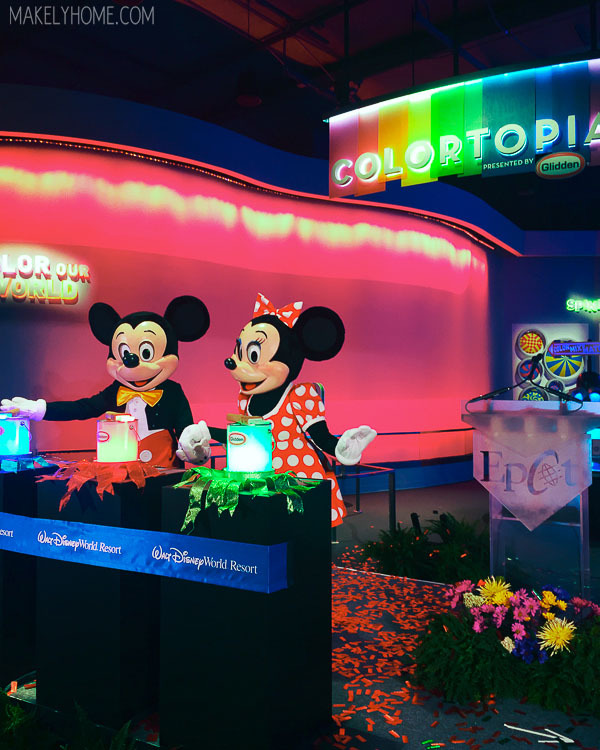 The opening was full of vivid color and magic – and the famous mouse couple in the world were on hand to usher us into Colortopia. My first thought was that Colortopia was like a hand-on children’s museum on steroids. Not only does it provide excellent learning opportunities for children, but adults will love the learning fun as well. 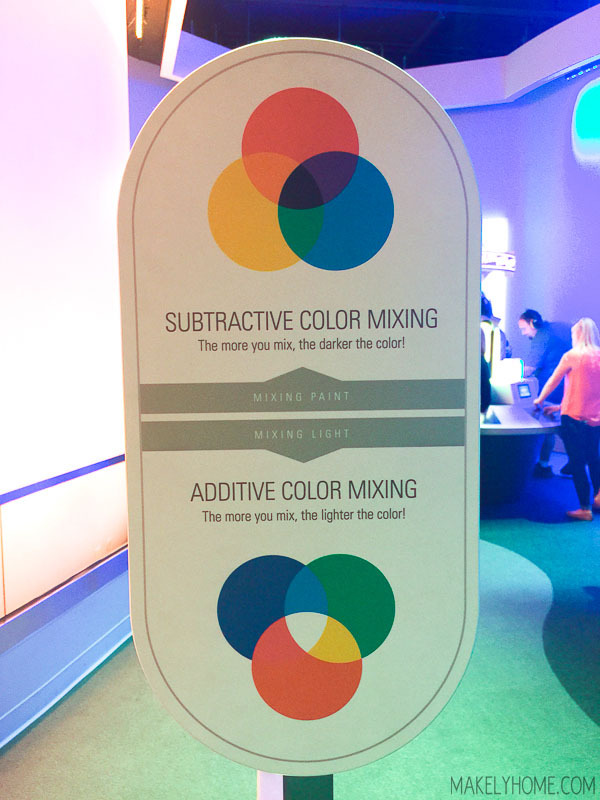 We all know about mixing paint colors, but how about mixing light colors? In one portion of the exhibit, you stand in front of what looks like a white wall. But once you block some of the light shining onto it, you see that the wall looks white because of the mix of red, blue and green lights aimed at it. Blocking the light enables the visitor to make colorful shadows on the wall. 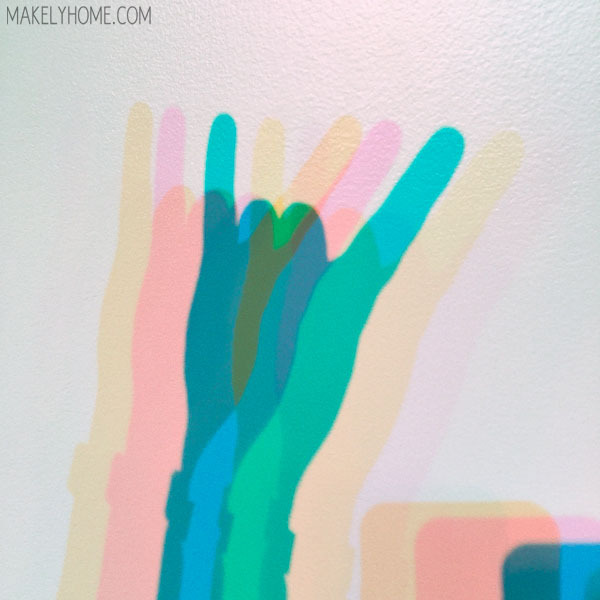 As we walked through the exhibit, I continued to be drawn to all of the vivid colors used throughout. 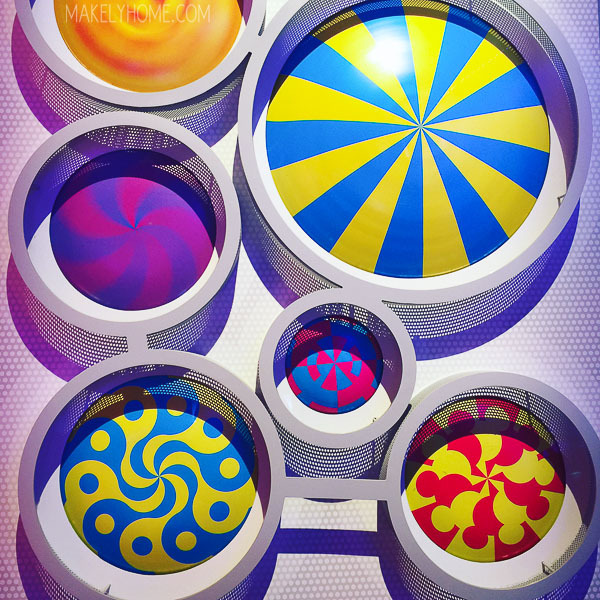 This portion of the exhibit, Spinning Spectrums, allows the guest to push a button causing these discs to spin. They spin so quickly that they become a solid color. But, let’s be honest – you know I kind of like just the crazy patterns and bright, primary colors on their own! But really, the highlight to me was the Magic Paint Brushes that we got to play with. As you can see, the bristles are made from fiber optics. 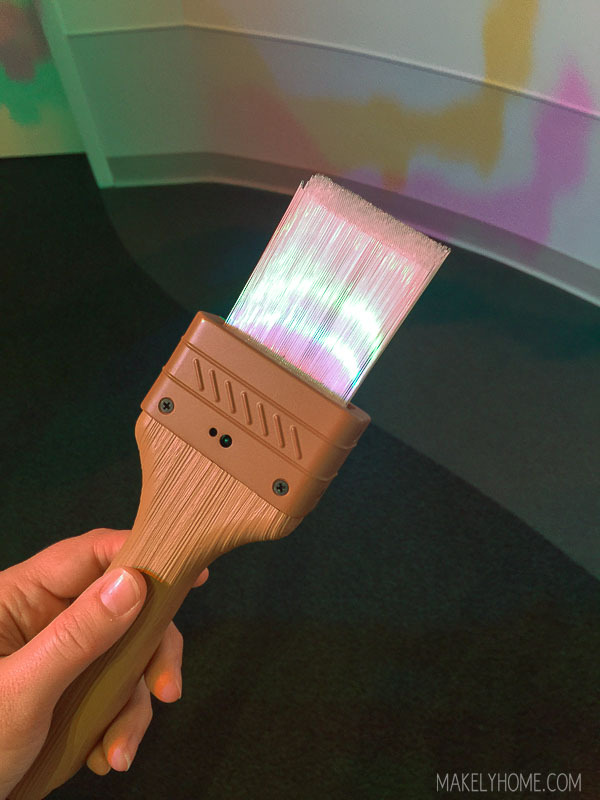 When you dip them into a lighted paint can, the bristles turn the color of the paint you selected. Then, you get to paint this huge electronic mural on the wall with your chosen color. Some of the elements of the mural animated once they are painted. Obviously, this is great fun for kids. But, hello! Adults will love it, too! If you can’t make it to INNOVENTIONS at Epcot®, there’s an app for that. You can download the Colortopia app to do a lot of fun things, like check out colors from the World Showcase, add paint colors to your own pictures, and paint the same murals that are in the exhibit (Emma has already spent hours doing that). There are even a few components that you can unlock at the exhibit itself. 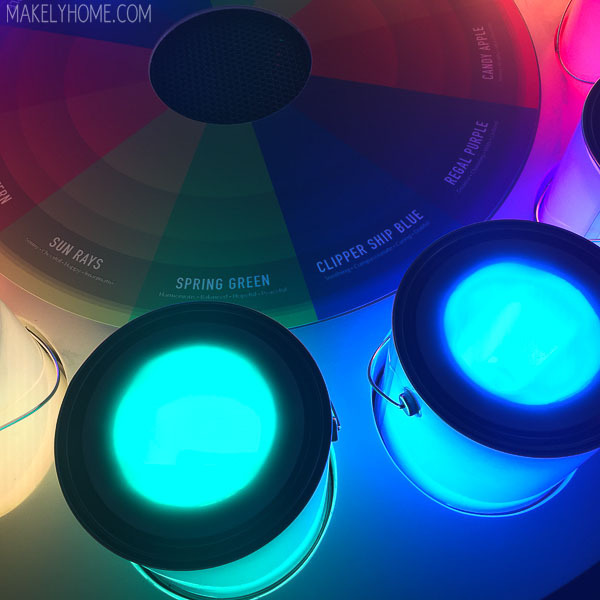 To celebrate the grand opening of the Colortopia exhibit, Glidden is giving away a $100 gift card to either Home Depot or Walmart (winner’s choice) to a lucky Makely reader. 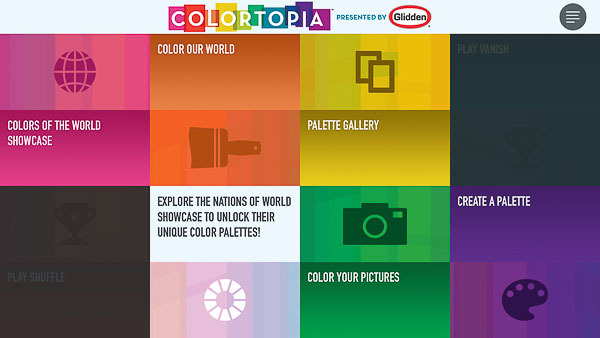 To enter, please visit the Colortopia Blog and tell me which color palette from the Epcot® World Showcase inspires you the most. Use the rafflecopter box below to complete your entry. Thanks to Glidden for allowing me to be a part of the opening of this exciting exhibit! As a MyColortopia Team member, this post is sponsored by Glidden. All reviews and opinions are my own.